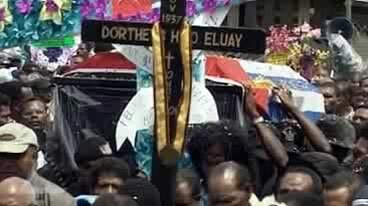 Video clip synopsis – A look at the life and death of West Papuan independence leader, Chief Theys Eluay. Broadband MP4 dream_bb.mp4 (17.8MB), suitable for iPods and computer downloads. End of a Dream is an excerpt from the documentary Land of the Morning Star made in 2003. Analyse factors which bought about change in the social experience of the community such as international regional or local events. Analyse the way in which the community and its supporters responded and were affected by these events; for example, revolt, acceptance, famine, immigration or adaptation. Analyse how this community or group has been represented in art, literature, film print and journalism, music or multimedia. Synthesise evidence to draw conclusions. Since World War 2 in the aftermath of colonial rule, various Pacific islands have been included as part of newly independent nations even though the peoples living there may not share ethnicity, culture or a strong historical connection to the newly formed central authority. Sometimes, as with the case of Papua and Indonesia, what was shared was the colonial master — in this case the Dutch. The Dutch had undertaken to let Papuans decide whether to be incorporated into Indonesia or to be independent. In what was named an ‘Act of Free Choice’, just over 1000 selected Papuans voted and the rest of the people were excluded from the ‘democratic referendum’. Papua became the 26th Province of Indonesia in 1969. Since then Papuans have complained that the vote was not an act of free choice. They want the one-person one-vote referendum they believe they should have had in the past. The case of Papua outlines the difficulty of drawing together disparate peoples into new nation states where cultural and historical ties are tenuous and fear and mistrust reign. In June 2000 the Papuan People’s Congress declared the independent state of West Papua and elected Chief Theys Eluay as its first president. In November 2001 he was found dead in his car and later a group of Indonesian Special Forces soldiers was found guilty of his murder. The Indonesian government had in October 2001 passed a special autonomy law giving the Province a greater say over the way its resources are managed, to try to placate a separatist movement. Today Papua continues to be an Indonesian province. Represent graphically the main features of the current Papua political situation. You might like to make this analysis by commenting on the role of the United Nations, the USA, Indonesia and the people of Papua. Describe the conflict of ideologies, ethnicity, nationalism expressed in the Papuan situation today. A debate titled ‘Papua should remain as Irian Jaya – a province of Indonesia’ is scheduled between the Papuan leaders for independence and President Susilo Bambang Yudhoyono. In groups, prepare short briefing cards outlining the main points for both sides. Do the people of Papua have the right to independence or is Papua a legitimate part of Indonesia? Discuss. Using a concept map identify the political and economic features of the Papuan situation from viewing the video clip. Explain the relationship between each of these features and comment on the impact this has had on the social life experienced by the Papua people. You might also like to view other clips from the documentary Land of the Morning Star.